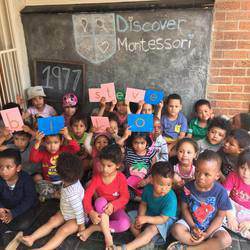 Thank you for your interest in the Discover Montessori School. We are a development centre that is whole-heartedly aligned to the world renowned Montessori Method, pioneered more than 100 years ago. We are building a centre that will ensure that your child is able to discover their potential in a fun, safe, loved and stimulating environment. The development centre caters for ages 2-6 years old. The reason here is that the children are in a highly sensitive period in their development as human beings. We will ensure that the stimulation they receive at this stage gears them for further development into productive citizens in society. Discover Montessori emphasises on the child’s natural ability and develops these interests in a loved, supported and carefully prepared, properly stimulated environment. Discover Montessori emphasises on the whole child, physical, emotional, cognitive and social areas of development. Our Montessori environment is carefully prepared to spark the child’s interest and the environment encourages self-discipline and independence. We have a mixed age group which encourages participation, children to teach one another and to collaborate. A child also has the freedom to choose their own work which sparks their independence and natural interest. The child has the choice to work individually or join a group in work or play. The Montessori material is multi-sensory, scientifically designed to develop a child holistically and allows the child to recognize his or her own errors. This gives the child the opportunity to correct his or her own work and reinforce own learning by repeating the work until satisfied and thus having that internal feeling of success. We have a beautiful playground and are well secured. We strive on observation so we can capture the child in their sensitive period of development. We encourage outside, purposeful play, getting a child busy in the garden does wonders to their senses. • We provide private schooling in our community. • We provide Academic, Sports and Music programs. • We provide an all inclusive pricing model. 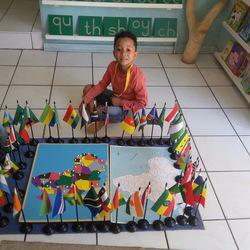 • We provide an individualised curricula per child.